All too often residents of Ashford talk about how so many shops are closing in the town centre and how there is no life left here. On one occasion, a comment was made in the local newspaper that the heart has been ripped out of Ashford. we’d like to disagree with that statement and say that, in fact, Ashford has a lot of heart, and a great number of caring, passionate and talented individuals. Talent’s not always expressed in a conventional and expected way but, then again, Ashford is by no means a conventional town. 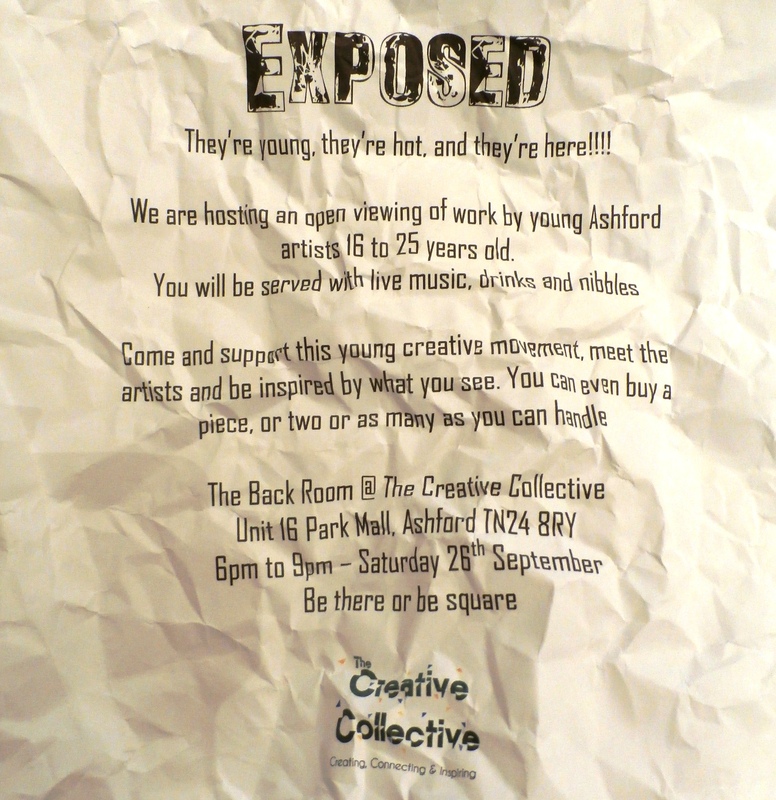 On Saturday 26th September, The Creative Collective is hosting an Art Fair in Park Mall from 9:30am to 4:30pm. The Art Fair is a platform for local and Kentish Artists to showcase their work in the heart of our town centre. Art can include ceramics, glass, sculpture, etc. We have 30 art stall spaces and will be hosting live music to entertain visitors. We will have a raffle for arty prizes as well as the chance to be involved in the Gallery and the work we do. If you would like to find out more please call 01233 421589 or email us at info@thecreativecollective.gallery. To book a stall please click HERE. Enjoy a day out with the family and bring your own lunch to eat whilst listening to some fabulous local bands. After the fair, at 6pm, an amazing event will take place at the Gallery. Take a look at our flyer for more details. We are still looking for more young artists, young bands, volunteers, supporters and sponsors for the event so please do get in touch if you have a couple of hours to spare, would like to make a donation, become a mentor, donate a raffle prize or simply need more information by calling 01233 421589, emailing info@thecreativecollective.gallery or by visiting the Gallery in person. A more comprehensive list of stallholders, bands and events will be published nearer the time. We hope to see you here. Recently, the Guardian published an article about arts centres and their role in social care. The article said: “Arts centres are not only havens for artists developing work, they also deliver cost-effective social impact and creative education”. This was not a revelation for arts organisations such as the Centre for Creativity and Enterprise here in Ashford. In fact, we see the impact that arts and crafts are having on people’s lives every day and receive many letters from past users to tell us of how their lives have been changed for the better.